i wonder if bark is a classic in anyone else's family. well... you might know it better as toffee crunch bars, or saltine toffee cookies. ring any bells? this year-round treat has become a staple for us. 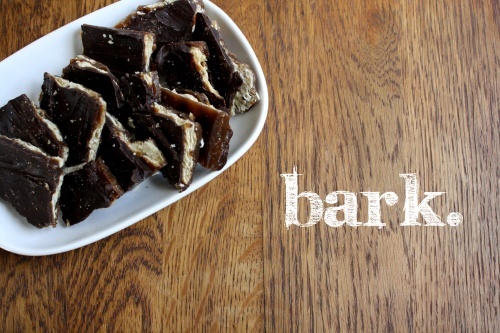 it can be found on the christmas eve dessert buffet, or on the sweets table at a summer party, but most commonly the place bark calls home is inside a plastic container on the third shelf of the fridge. we have a piece after dinner. or maybe two. or three... but don't leave the container out too long or we'll eat the whole thing. it's that good. at one of the parties over the weekend, we had a few bark-virgins. they had no idea what they were getting into when they picked up a piece off of the dessert tray. it didn't take long for them to realize just how addicting it is. that perfect marriage of sweet and salty... in rustic, bite-sized pieces. well, if there are any bark-virgins out there, today i am providing you with the recipe. i know, it's a dangerous thing. but if you're dying to try it after reading this, or just want to test your self-control... go for it. but don't say i didn't warn you. line a 10" x 15" jelly-roll pan with aluminum foil. butter the foil. this is very important. cover the pan with a single layer of saltine crackers. heat butter and sugar. boil for 3 minutes, stirring constantly. pour hot mixture over crackers and bake at 400 degrees for 5 to 7 minutes. remove from oven and, while still piping hot, cover with the chocolate chips and spread as quickly as the chocolate melts. you may add chopped nuts on top of the smoothed chocolate if desired. cool slightly and finish cooling in the refrigerator. break into pieces and store in the refrigerator or freezer.